Sports | Life is short,have fun!!! Scientists have debunked some long-standing myths about drinking water. Plus, guidelines for how much water you need every day. Arsenal fans and English Premiership League (EPL) followers in Nigeria will have the opportunity of watching the team play in Nigeria come August. Nigeria has been chosen along side Malaysia, China and Hong Kong to host Arsenal’s 2012 pre-season oversea tour in partnership with Emirates. 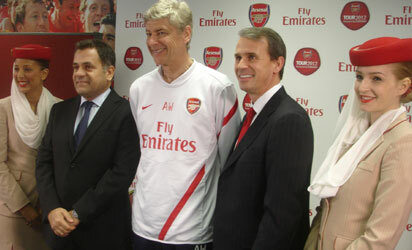 L-R Boutros Boutros, Emirates’ Divisional Senior Vice President Corporate Communication; Arsenal’s Manager , Arsene Wenger and Tom Fox, Arsenal’s Chief Commercial Officer at the Press Conference to announce the team’s 2012 pre-season overseas tour in partnership with Emirates Airline. Pix by Jimoh Babatunde. This was disclose yesterday at a press conference addressed by Arsenal’s Chief Commercial Officer, Tom Fox; the team Manager, Arsene Wenger and the Emirates’ Divisional Senior Vice President of Corporate Communication, Boutros Boutros at the club’s training centre in leafy Hertfordshire, London. Tom Fox said Arsenal Football Club is delighted to announce that its pre-season summer tour is to be presented by Emirates. During the tour Arsenal will play against a Malaysia XI side in the Bukit Jalil Stadium on Tuesday 24, July, and then the Gunners will travel to China to play against Manchester City in the Bird’s Nest Stadium in Beijing on Friday, July 27, before visiting Hong Kong for a match against national champions Kitchee FC on Sunday, July 29. Arsenal‘s Chief Commercial Officer Tom Fox said: “Arsenal Football Club is delighted to be expanding our long-term partnership with Emirates through our 2012 Tour. We are fortunate to have such a strong global partner who is as committed to these key markets as we are. Boutros Boutros, Emirates’ Divisional Senior Vice President Corporate Communications said: “Emirates and Arsenal started our journey together back in 2004, when we signed what was then the biggest club partnership in English football history. The Club last visited Africa during a tour to South Africa in July 1993, and is returning as a result of the fantastic support which exists for the team, not only in Nigeria, but across the entire continent. Sports Minister Sad Over Saintfeit Deal, Articles | THISDAY LIVE.